Most plot summaries of Raoul Walsh’s western Colorado Territory mention that it’s a remake of the great Warner Bros. gangster movie High Sierra (1941), but that fact is curiously absent from the opening credits. The screenplay is credited to John Twist and Edmund H. North, but there’s no mention of W.R. Burnett, who wrote the novel High Sierra, and there’s no mention of the earlier film. This is strange, since the change of setting from the modern day to the Old West could almost qualify this as a “variation on a theme” rather than a straight remake, but there are so many scenes and characters that are nearly identical to scenes and characters in High Sierra. I recently wrote a piece on producer Mark Hellinger for the annual “giant” issue of The Dark Pages, which was devoted this year to The Killers (1946). (You can order copies of The Dark Pages and subscribe here: http://www.allthatnoir.com/newsletter.htm). Walsh was a great director who made unabashedly commercial films with a great sense of scope and memorable characters. 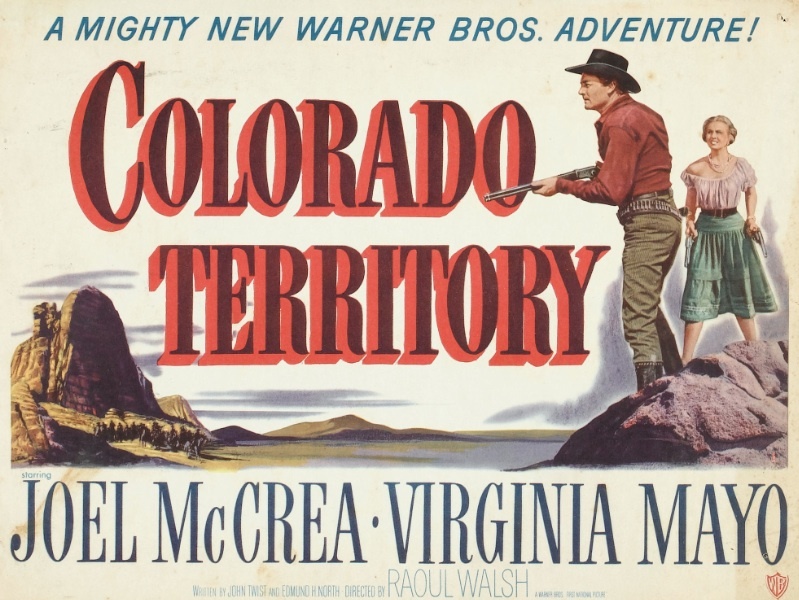 Colorado Territory isn’t ever listed among Walsh’s greatest achievements, but it’s a damned fine western that I think would be better regarded if it didn’t have such a generic title. If one were to scan through a list of westerns from 1949, Colorado Territory screams “B picture.” With a title like that, it easily could have been an RKO Radio Pictures western starring Tim Holt or a Republic Pictures western starring Roy Rogers (not that there’s anything wrong with that). And of course, just like High Sierra, there’s a criminal mastermind behind the scenes of the heist and a sweet, innocent-seeming girl whom our criminal protagonist idolizes for a little while before coming to his senses and realizing that he belongs with a straight-up ride or die chick. One of the problems with remakes is that no matter how good they are, it’s nearly impossible to lose yourself in them if you’ve seen the original film, since they constantly evoke it. 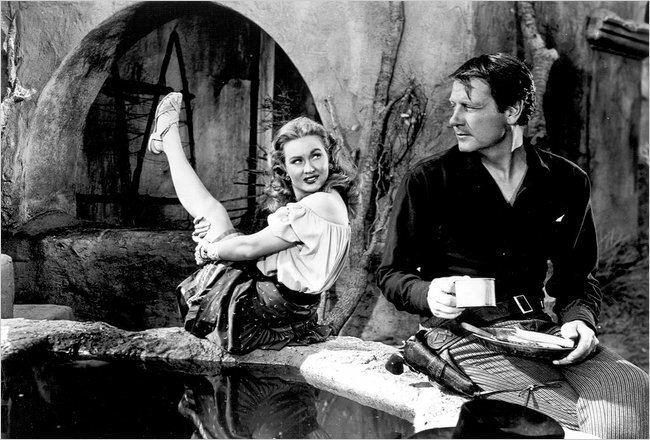 I like Joel McCrea and think he’s a great actor, especially in westerns. But he lacks the nastiness and cynicism Bogart had in High Sierra, which made his more human side stand out in such sharp relief. On the other hand, when a remake differs from its source material, it can make certain scenes even more shocking and emotionally affecting than they would be on their own, since you’re really not expecting things to go down that way. Colorado Territory has a few bits like that, and it’s exciting and well-made enough to stand on its own. Posted in 1949, June 1949 and tagged Dorothy Malone, Henry Hull, High Sierra, James Mitchell, Joel McCrea, John Archer, Raoul Walsh, Virginia Mayo, W.R. Burnett, Warner Bros., Westerns. Bookmark the permalink.